Super Bowl Nachos are the gold standard of nachos and include two types of chips for maximum crunch. 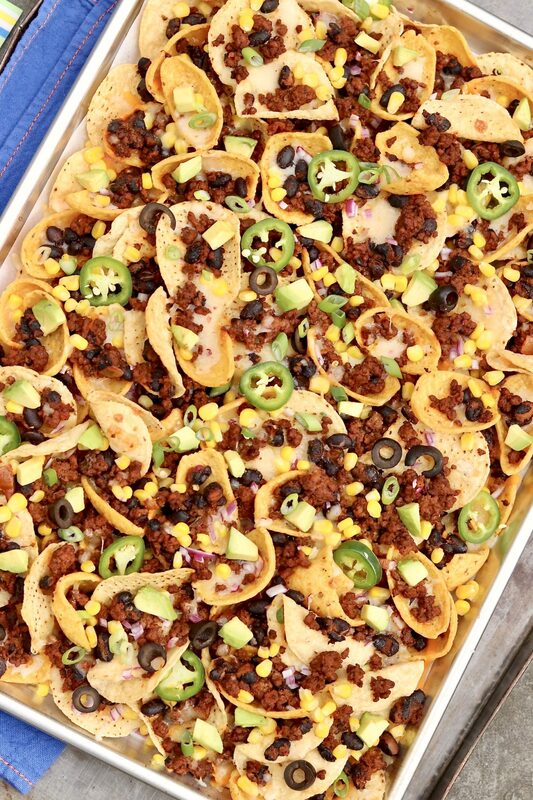 Loaded with flavorful toppings (with a hint of health appeal), these nachos are game day perfection and hearty enough to be an occasional meal! Special note: Below the nacho recipe is the unedited goodbye letter that I included with my final LNP column, published today, January 27, 2019. For all the readers who’ve found me there for the last seven years, I’m delighted you made your way here and I wish you a warm welcome! 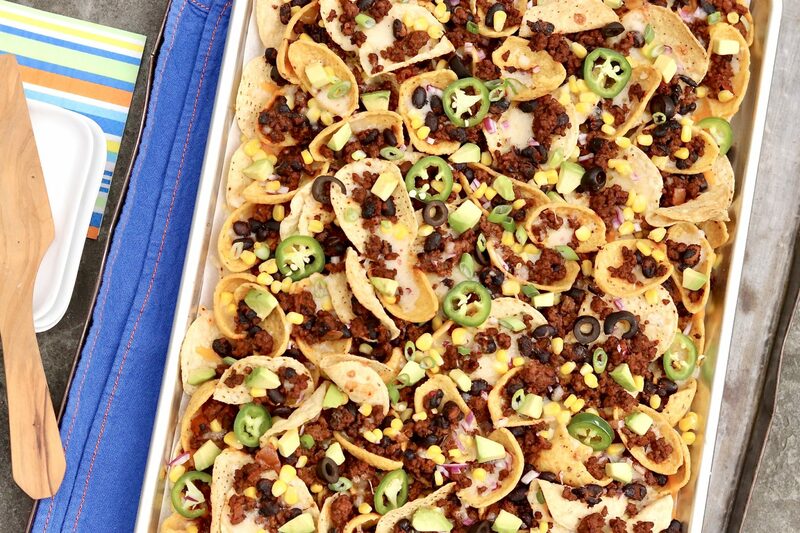 Nachos have always held a special place in my younger son’s heart, so the casual dish we typically associate with bar food or game day snacking makes periodic appearances as dinner in our house. Occasional indulgences align with my “everything in moderation” approach to eating. Plus, when one examines the toppings of these loaded nachos – ground beef, beans, cheese and a variety of veggies – redeeming qualities do exist. At my son’s prompt and because it’s always nice to be included, I called Dad with a request to join us along with a detailed dinner description. Full disclosure had been issued, but I need not have worried. My square-meal-loving father enjoyed the casual fare just as much as his grandson. Not a chip remained on the platter. Of course, my usual intent is to serve these hearty nachos during casual get-togethers, and my family often requests them on Super Bowl Sunday. Served as an appetizer in the context of other offerings, the recipe will feed a crowd. When enjoying as a slightly indulgent entrée, plan on six to eight servings. If hungry teenage boys are in the house (or an active 84-year-old, for that matter), I’ve learned to reduce the expected yield to four servings. Mixing beans with the taco meat mixture integrates and flavors the beans while increasing the protein content and heft of the dish. Christian will tell you that he’s not a fan of beans but adores these nachos, and he’s never requested their removal. Opt for thicker, sturdy chips that will hold up to the weight of the toppings. Thinner, restaurant-style chips tend to crack or become soggy when topped. In the following recipe, the use of two types of chips, including super-crunchy Scoops, is my trade secret. The extra thickness of the Scoops works well, and the variety offers special appeal. Freshly shredded cheese typically produces the best melt and gooeyness, although I’ve used pre-shredded cheddar and Mexican blend cheese as a welcome timesaver with good results. Distribute the toppings evenly. 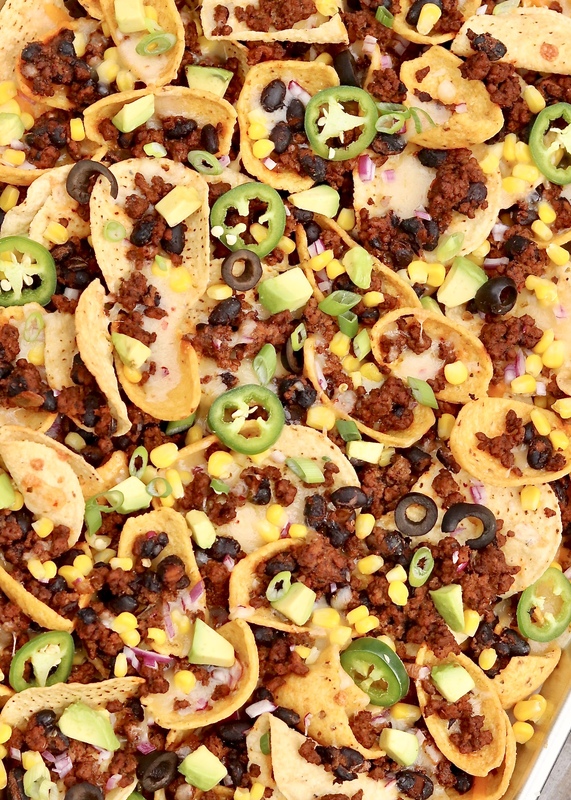 It takes a few extra minutes to create layers and dole out the toppings in an even fashion, but nachos are much more satisfying when all the chips contain some of the topping. Serve wet toppings like sour cream, guacamole and additional salsa on the side in little bowls with spoons so diners can add as desired. 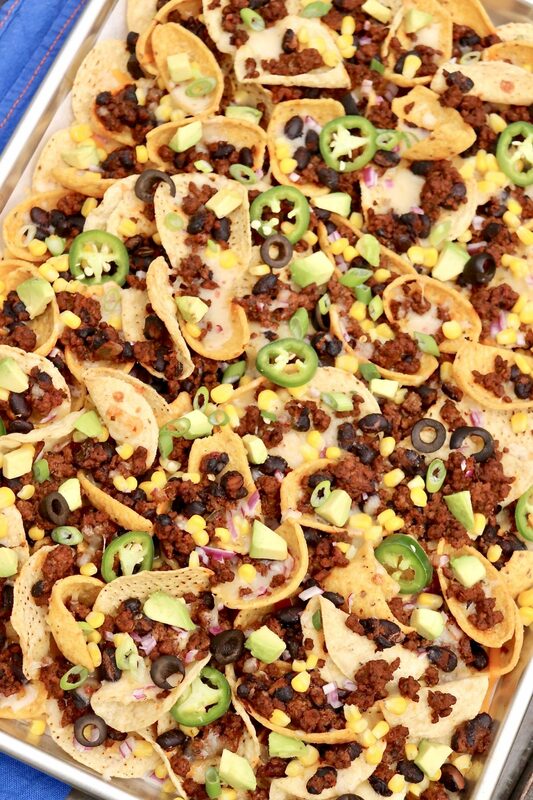 Dolloping wet toppings over the freshly baked nachos will cool them quickly and create sogginess (and few people relish a big bite of sour cream!). Several days ago, I received a phone call informing me that, due to budget cuts at LNP, today would be my last column. I had already submitted today’s recipe, but I was afforded the space to notify my truly fabulous readers of this unexpected change. When I began sharing my recipes and stories with LNP in 2012, I decided that my little corner of the paper should be a happy place. There’s too much bad news in the world, so why not forget about the disheartening and contentious issues for a while and focus on the lighter things in life, like enjoying delicious, easy-to-make meals with family and friends. Early on, I realized that this column could highlight more than just my family each week, and I felt privileged when I could use this space to shine a light on a handful of the many worthy causes and inspiring people in our community. The heartfelt feedback I regularly received from my faithful readers was an unexpected and treasured bonus. My mood always brightened when you told me that my page was the first thing you turned to every Sunday morning, and I was equally flattered by the serious sports fans who reported reading my column right after a quick check of the scores. I happily replied to every email and valued all the impromptu conversations as we met along our daily travels. The work I put into this weekly column far outweighed my paycheck, but the connection I shared with each and every one of you was priceless. You made this task a labor of love. The positive comments provided by those who cooked the recipes also served to raise the metaphorical bar. The last thing I ever wanted was for someone to spend precious time and money on one of my recipes only to be disappointed. What I do isn’t rocket science and it sure won’t create world peace, but I made lots of test runs and offered as many tips and substitutions as possible in hopes of smooth sailing at mealtime. While I will truly miss our Sunday morning get-togethers, the good news is that all of this started on my Fountain Avenue Kitchen blog and that’s still going strong. Fountainavenuekitchen.comis where I have always shared my recipes first, including the ones that appear in LNP, plus an additional midweek recipe. Join me there! In addition, I was asked to mention that those who’d like a reminder when new recipes are posted can sign up for email updates by simply entering your email address in the blue box on the right side of any page on my blog. There are never more than two weekly emails – and I don’t sell or share email addresses with anyone. Many readers ask if I’ll ever run out of recipes, and believe it or not, after all these years I still have a long and growing list. Beyond my personal creations there are countless gems from family, friends, readers and local restaurants, along with compelling stories in the works about some remarkable people among us. So as I sign off one last time (and wipe a wayward tear), I raise my coffee cup to you in profound gratitude for your time, feedback and genuine interest over all these years. I look forward to continuing our conversations online and around town. Now enjoy the nachos! Hi Patty! Thank you for your kind words. I’ve received so many lovely emails this morning and am truly sad to say goodbye to such a loyal group of readers. I just added the original goodbye letter I wrote for the newspaper (under the recipe on this post), as it’s a bit different than what was published and for those who may have simply missed today’s paper. It was a wonderful seven years! You were my go to place as I learned to cook & bake better after my wife died 6 years ago. I routinely made your Sunday recipe for family and friends. I still have several jars of homemade Vanilla. It is comments like yours, Jim, that make this job of mine worth doing. Thank you for taking the time to let me know. I bet your family and friends cherish that time with you on Sundays! Truly sad to see your column go! Recipes were a big hit with all 4 teenagers in the house. Oh, if you haven’t already, please feel free to enter your email in the little blue box on this site. That way you’ll receive email links to new recipes － only 2 per week and I never share or sell the email addresses! Dear Ann, I first found you online and was later thrilled to see you in the Sunday News. I’ve tried a number of your recipes and never been disappointed. I too will miss seeing you every Sunday. Somehow I have grown to feel as if I know you as a friend. Thanks so much for the many inside stories that accompany your recipes. That made it so personal and fun! The feeling is completely mutual, Christine! I feel such a special connection with my readers, and I really hope many of those who can no longer find me in the paper will find their way here. It would be wonderful to start a fresh, new dialogue through the comment section of the posts where we can all enjoy the comments, suggestions and feedback from others. Above all, thanks for being one of my longtime, loyal readers…I’m so lucky! Your comment makes me so happy, Marie. Thanks for letting me know and for being a regular in this space. Please feel free to comment and share feedback on any of the recipes going forward. It will be a treat to have that kind of dialogue among readers in a fresh, new way! My family devoured our Super Bowl Nachos last night. Best nachos ever! Thanks! Such great news, Katie! Thank you for the feedback!